Just a quick reminder to join us for our Annual Fall Kick-Off Sale this Sunday, October 6th. We'll be open from 10am until 4pm, and everything (plants, trees, products, soils) will be 10% off. Plus, our good friends at Great Big Plants have once again supplied us with Trial Size bottles of their wonderful Liquid Compost Concentrate, so the first 24 customers will receive one free as a Gift with Purchase! Thanks Great Big Plants!! Major Cross-Streets: Olympic Blvd. & La Brea Ave.
No Pets, please. Street parking available. Car pool with your gardening pals!! And at very long last, we'd like to share the video of our Glass Gem Corn Adventure!! This was the most incredible learning experience of our whole gardening history! We so hope you enjoy this video and plan to make a space for the Glass Gem in your Spring 2014 garden!! You will love it!! Attached are some pictures from our latest crop from the Bell Homeless Shelter garden. All the veggies came from plants purchased from Two Dog. 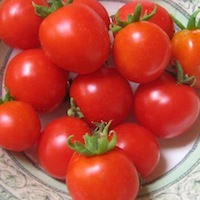 The tomato plants, as you can see from the pictures, have been prolific. My team and I have delivered pounds of tomatoes and cucumbers to the Shelter's kitchen each week. As I have mentioned to you before, the Bell Shelter is the largest homeless shelter west of the Mississippi serving veterans and homeless men and women. The Shelter's kitchen serves approximately 6,000 meals per week. Their budget for fresh produce is a mere $300 per week, so the kitchen staff is forced to purc hase the lowest grade fruits and vegetables. Thus, the food served at the Shelter is marginal. My non-profit, GrowGood, seeks to transform the one-acre vacant lot across from the Shelter into a garden that can provide fruits and veggies to the Shelter's kitchen as well as therapeutic and job training opportunities for the Shelter's more than 350 residents. We are grateful for all your support and for supplying us with healthy wonderful plants, so we can continue our mission to serve the residents and staff of Bell Shelter. You're welcome, Brad!! "Good on ya" for the work you do, and we look forward to helping you with continued bountiful harvests! And if any of our Two Dog friends are inspired to help out, please contact Brad through his non-profit, Grow-Good.org. That's it for now! We hope to see you this coming Sunday! Annual Fall Kick-Off Sale Announcement! plus some other Fun News!! So here we are in the Dog Days of Summer...Our garden is slowing down and looking fairly ratty, and we've begun the seasonal transformation... We've had a very abundant season, though, and we hope you have, too! From the many wonderful comments and photos you've sent, we surmise that you did. Here are some photos of our Summer Harvests! 2013 Winter Tomatoes are a hit!! The "Winter Tomato Open House" we held last month to kick-off this new venture was surprisingly well attended (especially for a 90 degree Wednesday)!! We're grateful to all of you who came out, and especially those who traveled the distance from our Farmers Markets locations, and even from Seal Beach! Thank you, thank you! Your support means everything. Click the image above to see the line-up! EVERYTHING - all Organic Seedlings, Fruit Trees, Berry Bushes, EarthBoxes, Smart Pots, Soils & Fertilizers 10% OFF!! and we'll have Cookies & Lemonade, too! Until now, like their parent organization, they have only sold Native plants, but beginning with their Fall Event on October 5th, they will be carrying our own Two Dog Certified Organic babies! In their own words, "Grow Native Nursery works with the VA Greater Los Angeles Healthcare System to maximize veteran's opportunities in the sustainable horticulture industry. We are a not-for-profit nursery helping to support the conservation work of Rancho Santa Ana Botanic Garden." and we're looking forward to a really great relationship!! Our Certified Organic Fall Potatoes have just arrived, and we'll have them at the Markets this weekend!! New for us this year is the gorgeous "Purple Majesty" Loaded with anti-oxidant Anthocyanins, these are deep purple through and through! And, we just received our Certified Organic Garlic & French Red Shallots! And great news: "Music" Garlic is back!! This extremely popular variety was unavailable last year due to an industry-wide crop failure...so happy to see it return! a very gourmet variety, after a 2 year wait! weekend, more will come. Popular Demand has never been greater, and we're so happy to see everyone gardening year-round! A new variety we just discovered, which is sure to be a hit, is called "Rainbow Lacinato"...it's a cross between the much-loved Lacinato and Redbor Kales. We just received the Certified Organic seeds, and are sowing a ton of it! Stay tuned! We've also switched to a shorter "Days to Harvest" variety of Brussels Sprouts called "Franklin" ... they'll be ready nearly 3 weeks earlier than our previous selection. And our Pac Choi this year is a smaller variety called "Win Win"...the name says it all! We love getting your photos and hearing about your garden adventures!! "HI...just wanted to say I was so impressed with the corn we planted...I loved seeing the cycle and how much water it takes to grow corn or everything else for that matter. Gives me a new appreciation for those farmers out there. Corn was so sweet...I loved it. Time for a new project!" (Above) Our Customer Beth has two strong helpers who are very proud of their new blueberry bushes! Please send us your photos and videos! You could be featured in our next newsletter! 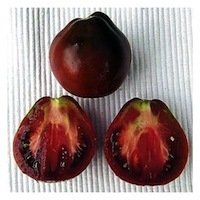 "Winter Tomatoes" & "Fall Veggie" Website Pages to get your shopping list ready! We hope to see you here! Thanks, as always, and Happy Harvests! for our 1st Annual "Fall/WinterTomato" Open House! 1st ever Fall/Winter Tomato line-up! 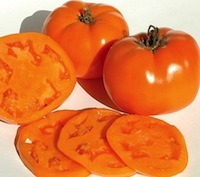 15% OFF Great Big Tomatoes! You will LOVE the results!! AND a nifty "Gift with Purchase"!! will receive a FREE 4oz. bottle of Great Big Plants...enough for a full gallon of this excellent Certified Organic Liquid Compost! We use it to water-in every seed we sow!! Thanks to our good friends at Great Big Plants for their support and generosity!! See more about these 2 great products here! It's going to be a fun day...bring a friend. Street Parking's available.